Whooo doesn't love an owl? I know I do. This cute little owl is made with the Create a Critter2 Cricut cartridge, p. 57, cut at 3-1/2 inches. I cut the the layers in various Halloween colored papers and put it all together to create this multi-colored owl for Halloween. The witch's hat is is cut at 3-1/2 inches also. I cut a white shadow piece, slightly offsetting it behind the owl, to create the shadow. I used Wink of Stella on the hat so it would stand out from the black background better. The branch is also on p. 57 and is cut on the accessory setting at 4 inches. I also cut one in white to offset below the black brand to create the shadow. 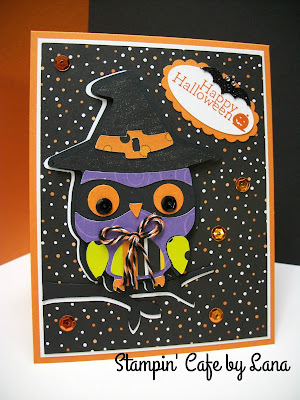 The papers used for the owl are just scraps from my stash, but the card itself is made with Stampin' Up products. The base is 4-1/4 x 5-1/2, top folding, using Pumpkin Pie cardstock. The white layer is cut at 4 x 5-1/4. and the black, orange and white patterned paper is from the Halloween Night DSP, cut at 3-7/8 x 5-1/8. The greeting is also from Stampin' Up, a retired stamp from the Delightful Dozen stamp set. I used a small oval punch and a scalloped oval punch layered together. The little bat is a sticker from Hobby Lobby. The bow is made with Recollections orange, black and white baker's twine from Michaels. I added two black sequins to the eyes and I also scattered some orange sequins around the card to finish it. I will have one more Halloween card next week, a little simpler, so if you like to keep things simple, then come back for that one!